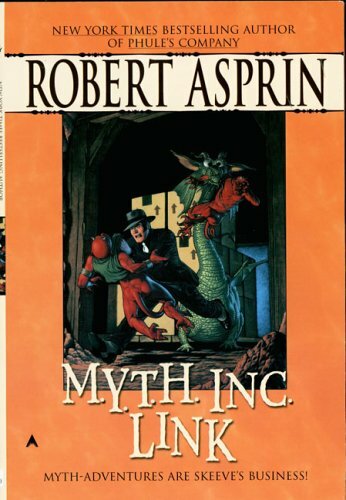 While planning my post on said bookisms, I began reading a series by Robert Asprin called Myth Adventures. My husband convinced me to read the first book, Another Fine Myth, and it was pretty easy to get hooked. One of the first things that grabbed my attention—other than the clever parodying of fantasy tropes—was the wanton use of said bookisms. “Cold, vicious, and bloodthirsty,” the demon gasped. “You’d better believe there’s something wrong,” Aahz snarled. On some pages, I felt like every line of dialogue was followed by a said bookism. But though I noticed them and they pricked at me, they did not turn me off of the story. As I was writing up last week’s blog post, I stopped to ponder why that was. Fundamentally, Asprin gets away with his said bookisms for three reasons: timing, genre, and writing skills. First off, Another Fine Myth was published in 1978. As I mentioned last week, the publishing industry went through a dialogue tag etiquette paradigm shift some time in the last few decades. Said bookisms were embraced and even encouraged at one point, though they are now disparaged. Robert Asprin’s dialogue tags were appropriate to the era in which he was writing. Now, the series continued up to (and beyond) the author’s death in 2008. I’m just about to start on the 7th one, which was published in 1986. I’ll be interested to see if his use of dialogue tags changed as he wrote for a changing market. But I’m not certain he would have had to, primarily because of my second justification. Wikipedia classifies Myth Adventures as straight fantasy; both amazon and goodreads add the subcategory of humor. I would almost go so far as to call them parodies. In his introduction to M.Y.T.H. Inc. Link (1986), Asprin described his reasons for writing the series: “I had always wanted to try my hand at Heroic Fantasy… The field had been getting increasingly solemn and grandiose, and to my eye was long overdue for a good lampooning.” (p. vii). And a good lampooning is what he provided. From the very beginning, the tropes and expectations of the fantasy genre are turned on their heads. The apprentice’s grey-bearded master magician is killed in the very first chapter, and Skeeve is left to be mentored by a demon whose powers have been stripped by a practical joke. Throughout the series, Aahz and Skeeve go on delightfully hilarious adventures, all the while poking fun at “traditional” fantasy characters, plotlines, and themes. Everything is over the top. As such, his use of sometimes grandiose and excessive dialogue tags fits right in. Asprin may even have used so many said bookisms intentionally, for comedic effect. Said bookisms read as theatrical and melodramatic—they can make readers want to laugh. So if you’re trying to make them laugh, perfect. But whether or not genre or timing explain why Asprin chose to use said bookisms, the third reason is why I, personally, can overlook them. Robert Asprin was simply a good writer. Though he used a lot of said bookisms, Asprin also used plenty of descriptive sentences to break up the dialogue—and he used “said” often enough that I was surprised how many times I saw it as I searched for said bookism examples to use in this post. (Which just goes to show again how invisible “said” can be). Since the rest of his writing was so good, suboptimal dialogue tags didn’t matter. Above all, Asprin’s dialogue is absolutely brilliant. The witty banter is full of puns and anachronisms that fly right over Skeeve’s head, to the delight of the reader. Each character’s voice is distinct. Aahz; Skeeve; Chumley the British troll and his assassin trollop sister Tananda; Guido and Nunzio, the mobster bodyguards: each character Apsrin introduces has a unique personality that is matched by a unique way of speaking. The dialogue practically flies off the page, and I found myself lapping it up, regardless of tags. If you’re good enough at writing, you can break any rule and get away with it—but your writing in other areas has to more than make up for it. And, I would say, you have to know what you’re doing. Intentionally breaking a rule for a good reason is poetic license. Accidentally breaking a rule through ignorance just leads to weak writing. It all comes down to intention. If you want to write a parody with flawless dialogue and pile on the said bookisms, go for it!